Don't Miss This Incredible Deal! I'm so excited at what Classical Academic Press is offering my viewers on this newly released book -that I want to jump right to the good stuff and share it with you first! CAP is offering a giveaway of their Teaching from Rest Bundle to one blessed viewer! Enter the giveaway at the bottom of this page. That's not all! Between now and September 7th, you can take part in my exclusive limited time deal of 20% off the already discounted bundle price of $17.95, just by using the code SGREST20 at check out! That's an incredible deal, making it less than $15 for the brand new Teaching from Rest book, PDF Companion Journal, and the incredible MP3 Audio Companion! You can also use the discount to buy those pieces individually, but the bundle is a great deal and each piece is so awesome, you won't want to miss any one! Want to buy, but wondering if you should wait to see if you win the giveaway first? No problem - you can do both! If you buy now to get in on this great deal, and then happen to win the giveaway, Classical Academic Press will just refund your purchase amount! It's a Win-Win! I've read this book multiple times. It's one of those books you want to just read, and re-read, and highlight, and star, and underline, and, well...you get the point :). I really want you to read this book for yourself, and I don't want to steal any thunder from the incredible insights, inspiration and instructions that are contained within. So, I'm going to give you some highlights, and just trust me, you want to own this book and read it often! Who's "Well Done" Are You Working For? 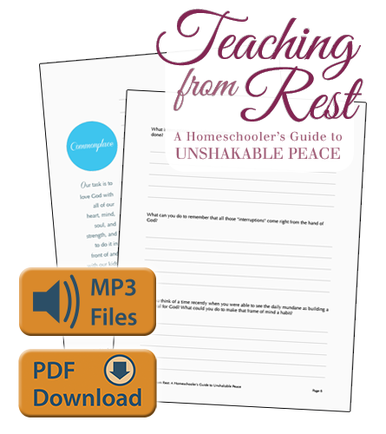 There is great depth in each of those topics and they are elaborated on, in a way that we can all relate to as homeschooling Moms. I've spent a lot of my summer reading philosophy books on classical education like The Liberal Arts Tradition and Norms & Nobility. I love philosophy books. What I love about this book, is that it's got the depth of a good philosophy book (giving you big ideas to wrestle with), yet it's more of a how to manual for Moms. The ideas presented are impactful, and cause the reader to contemplate their relationship to their children, to God, to the curriculum they are using or following, and to one's own self. Powerfully packed ideas, succinctly written and executably understandable. It's a brilliantly written book. You can go here to get three free chapters to see what I mean -you will be hooked! Andrew Kern: Teach from a State of What?! Recognizing that our daily grind is holy ground - teaching is holy work. Considering that my child may be a cathedral for God's using that I am being given the privilege to help build, is an awe inspiring and convicting truth. These little people aren't the interruption of our to-do lists, but rather, the very reason we are doing this! Practicing "cheerful interruption" has been my conviction since reading this. It is so interesting how hard that can be some days! The shift in paradigm on Curriculum is huge - at least for me it was, and I suspect for most of us. It's what has moved me from doing what I was for five years, to what I'm now doing with Schole'. The idea that curriculum is something you don't just teach but we embody and love - is huge. "It's the form and content of our children's learning experiences." It's more about what they can uncover than what we cover. Knowing that I don't have to finish the book or cover it all - what freedom in that and yet, it's not about blowing off the curriculum in favor of PJ's and movies, rather, it's about making the curriculum your servant and not your master. 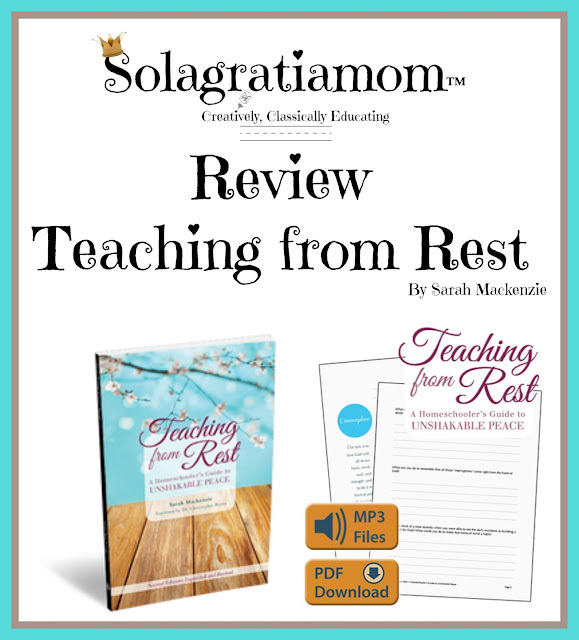 Other concepts such as loop scheduling and her practical how to's on paring down your curriculum and recognizing what is worth keeping and what is worth letting go of, is very helpful. I love the reiteration of what we were already doing with Morning Time, and how impactful in the long run to your child's formation it is. It's about depth and not breadth - increments with forward progress and not focus on completion and checklists. 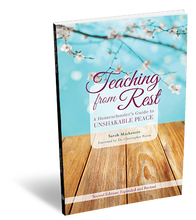 How to become a peaceful and happy mother - consider what your strengths and weaknesses are and working within them to educate your child. What do you love? What are you passionate about and want to share with your children. Fill up your own tanks so you have something to give. Take the time to spend in leisure for yourself and restful learning, so you can pass that on to your children. We too must practice Schole'! I've been meaning to purchase this book for awhile, it is on my wish list for my next book order! I've been planning to order the book when I get back from vacation next week but this bundle looks way more fun!! Me too! :) Thanks for stopping by.